This fifth edition of a classic and comprehensive resource presents an applied, realistic view of entrepreneurial finance for today’s entrepreneurs, completely updated to address the latest trends and technologies. The book provides an integrated set of concepts and applications, drawing from entrepreneurship, finance and accounting, that will prepare aspiring entrepreneurs for the world they will most likely face as they start their new businesses. The contents are designed to follow the life cycle of a new business venture. Topics are presented in logical order, as entrepreneurs will likely face them as they begin the process of business start-up and move into growing the business. Both undergraduate and graduate students will appreciate the clear presentation of complex issues, and this book is an essential resource for budding entrepreneurs as well. A comprehensive spreadsheet financial template is included with the book, and an all-new case study provides questions that will help students learn the template as they proceed through the book. This tool allows for the application of many of the concepts to actual businesses and can be a valuable supplement to the process of developing a full business plan. The spreadsheet financial template is available for unlimited free downloads at Professor Cornwall’s blog site: www.drjeffcornwall.com. 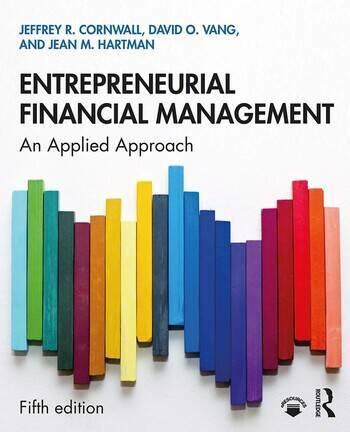 WHAT IS ENTREPRENEURIAL FINANCIAL MANAGEMENT? WHAT MAKES ENTREPRENEURIAL FINANCE SIMILAR TO TRADITIONAL FINANCE? WHAT MAKES ENTREPRENEURIAL FINANCE DIFFERENT FROM TRADITIONAL FINANCE? WHY IS CASH FLOW DIFFERENT FROM NET INCOME? WHY Is AN ACCRUAL-BASED INCOME STATEMENT IMPORTANT? How Is CASH FLOW MEASURED? Jeffrey R. Cornwall is the inaugural recipient of the Jack C. Massey Chair in Entrepreneurship at Belmont University in Nashville, Tennessee. He has a DBA and an MBA from the University of Kentucky. David O. Vang is a professor of finance in the Opus College of Business at the University of St. Thomas in St. Paul, Minnesota. Jean M. Hartman holds a BA in business administration and accounting from Southwest Minnesota State University and an MBA from the University of St. Thomas. She is a certified public accountant.